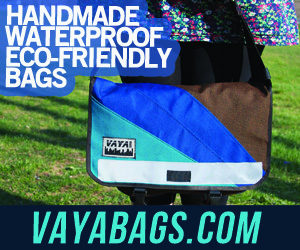 « Premium Rush, messenger movie keeping local, Vayabags Interview. More videos to start your week off, right? Here’s a blast from the past. Love the hair helmet. Dan Powell is the co-owner of Portland Design Works, a sometimes contributor to Urban Velo and the real deal guy in the industry who just loves to ride a bike. I’ve spent some great times raging on two wheels with Dan—if you like Urban Velo you’d like his sort of trouble. He’s the guy grilling dogs in the Rock Racing cap. Pretty awesome to see PDW doing so well the past few years, and even better to see how far they’ve gone in spreading the love back to the rest of the cycling community. A model for us all. It was a smooth and fun ride to Bicycle Film Festival Helsinki and back. Join the conversation and tweet #InvsHelmet to have your tweet featured on the Focus Forward website. Go to focusforwardfilms.com/films/49/ to see the discussion. Party in Soho. Sounds cool for Rhode Islanders. Better yet it was about bikes and art, and the cultural transformation that is taking place cities. With beer too. At the alluring Bicycle Habitat on Lafayette Street. Thank You for Affinity Cycles for the Metropolitan frame, it’s really a fast frame and a nice geometric track set up and good to be handle on the New York’s streets. This is the same model use by Austin Horse and Joseph Gordon-Levitt in the movie “Premium Rush” premiere it this August 24, 2012. “Premium Rush Bicycle” aka AFFINITY (METROPOLITAN) Frame from Urban Cyclist Worldwide on Vimeo. This is Lindsey’s video submission for Raleigh Bicycle’s My Reason to Ride contest. She talks about her passion for cycling, why it helped her to learn a new city, and why she started her mass-themed ride group, Crank-Set Rides. My Reasons to Ride – Lindsey Bower from Dan Krivenki on Vimeo. BFF – psycho beach party gold sprints from The Skeleton Key on Vimeo. ALLEY CAT RACE from Jean-Darcel Michel on Vimeo. Welcome to the Team Edgar “WILLO” Juarez from Mashafix.com on Vimeo. T H E ‘ B I K E ‘ from Andrew Rusli on Vimeo. Iridefixed Modena from pietro occhiuzzi on Vimeo. The goal here is not just to arrive victorious and breathless in Montreal (although.. you can count on this happening), the event is aimed to raise awareness and to raise funds for IMPACT’s mission. Next destination: New London, Providence and Boston! Designed to hang nicely under the saddle of most any bicycle, the No. 15 transports all of your essentials without the burden of a backpack. Save your shirt and your dignity on a hot summer’s day, unless you always ride shirtless. It’s big enough to hold a 15-case of beer, roughly 15x11x7″ when rolled up. The joy of the No.15 is its versatility. If you want to leave your saddle alone, you can throw it in your basket, strap it to your rack, attach it to your handlebars, sling it over your shoulder—the possibilities are endless. Where we’re from, rain is an inevitability. Constructed from durable waterproof materials, the No. 15 will keep your things dry in a downpour. This doesn’t mean its 100% waterproof, but it’s pretty damn close.